On October 1 1916, the inhabitants of Potters Bar, Middlesex were witness to the fiery destruction of a raiding German Zeppelin that came down on the Oakmere Estate.All 19 crewmembers perished,including the airship's redoubtable commander Kapitanleutnant Heinrich Mathy. This evocative century-old event is now commemorated by Ray Rimell in this new book officially published on 1 October 2016; with the aid of many contemporary eyewitness accounts,plus official military records and personal family archives ,the author presents a fulsome account of the night's drama and traces the wartime career of L31's commander as never before. 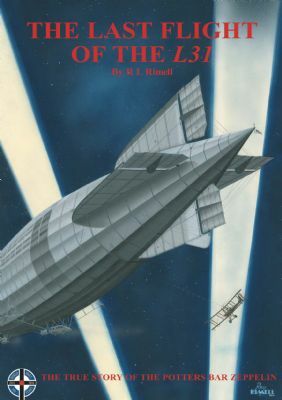 The true story of the Billericay Zeppelin is related by Ray Rimell in this new book published to coincide with the event's centenary in September 2016.